This is one of those picture books that I read through and immediately, thought: “YES, YES, that is exactly how it feels.” I love this book! I wish I could order hundreds of copies and send them to everyone I know. My Two Blankets is the story of a little girl whose auntie calls her Cartwheel… that is, until, the war came. The little girl and her aunt leave their country to escape the war and the violence. This new country is a strange place. She feels sad and lonely. She misses her home, her country, now far away. Everything in this new country is strange and cold and harsh, even the wind …. She wraps herself in her blanket, her old blanket. 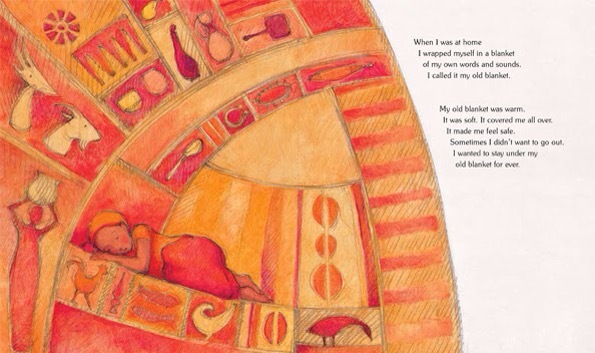 The blanket is illustrated in bright oranges and reds and shows scenes from her life back in Africa – goats, birds, hair combs, bracelets, and cooking utensils. She describes this blanket as warm and safe. She wishes she could stay under that blanket. Then one day, in the cold, new world, she meets another little girl in the park. She smiles at her. Soon, with the help of this new friend who reaches out to her, she learns new words. She begins to weave a new blanket…at first thin and small, but it begins to grow. This blanket is illustrated in soft pastels of blue and green, and is filled with new symbols: a book, a cat, a birthday cake, a swing. This new blanket soon becomes warm and soft. 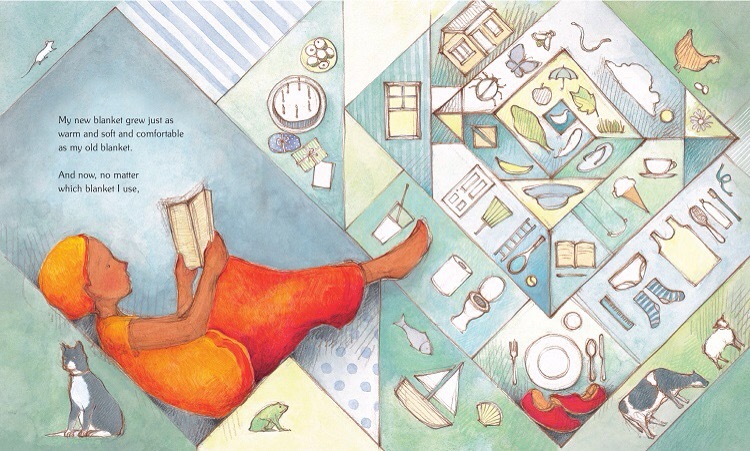 This picture book is a visually stunning metaphor for young children. It explores and puts into words and images the concepts of culture shock, grief and loss and dual cultural identity. 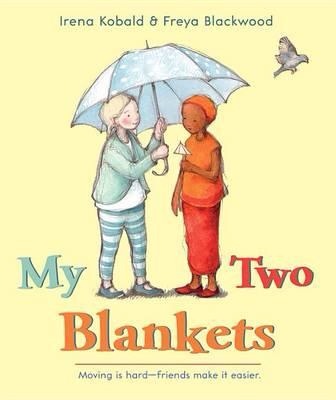 My Two Blankets is also a great way to expose children to what it is like to be a refugee. My Two Blankets is an 2015 award winning book in Australia (Children’s Book Council of Australia Award) by a debut author, Irene Kobald. The book was inspired by her own daughter’s friendship with a little girl from Sudan. It is illustrated by an award winning illustrator, Freya Blackwood. She is the winner of the 2010 Kate Greenaway Award for Harry and Hopper, another excellent picture book that explores grief and the loss of a beloved pet. My Two Blankets was originally published in Australia and is now published by Houghton Mifflin. I highly recommend this book.